Routing number of Chase Bank is a 9 digit number required for initiating various transactions such as direct deposits, domestic and international wire transfers, electronic payments, automatic payments (ACH) etc. These numbers are also known as banking routing numbers, routing transit numbers, RTNs, ABA numbers etc. The easiest way to find your routing number is to look at your checks. 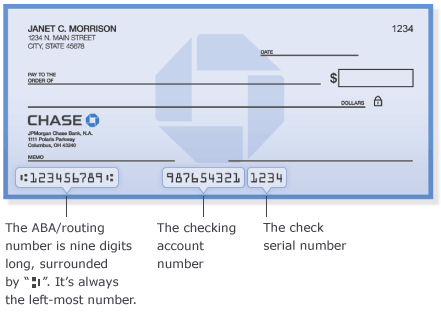 It's easy to find Chase's ABA Routing number and your account number as shown below. They're printed across the bottom of your checks. Or if you prefer, call 1-800-242-7338 and Chase Bank can tell you your ABA/routing number.